The heart has four chambers – two atria (right and left) and two ventricles (right and left). Blood from the rest of the body or the lungs enters the right and left atrium respectively. The atria then pushes the blood into the ventricles. The more muscular ventricle wall contracts sending the blood into the pulmonary artery or aorta. Blood exits the right ventricle and travels to the lungs (pulmonary artery ~ pulmonary circulation) and out of the left ventricle to the rest of the body (via aorta ~ peripheral circulation). The heart valves are sets of flaps (leaflets or cusps) that prevents the movement of blood against the direction of flow – from an atrium into a ventricle and then out into the artery (pulmonary artery or aorta). 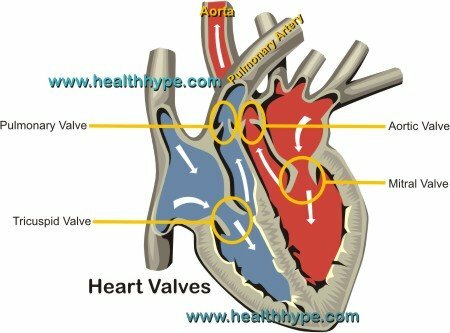 Valves between the ventricles and blood vessels exiting in (pulmonary artery or aorta) known as the semilunar valves. The atrioventricular valves (tricuspid and mitral) prevent backflow of blood from the ventricles into the atria. This is more likely to occur when the ventricles contract (systole). The tight seal created by these atrioventricular valves ensures that the blood in the ventricles are forced out into the pulmonary artery or aorta. The tricuspid valve has three flaps while the mitral (bicuspid) valve has two flaps. These valves open and close passively. That means it opens when blood is being pushed from the atria into the ventricles by the force of the flowing blood. Similarly it closes when the blood under pressure in the contracting ventricles pushes against it. The atrioventricular valves have a safety mechanism to ensure that it does not bulge excessively when closed. Papillary muscles attach to the vanes of the valve via chordae tendinae and contract when the ventricles contract. This provides resistance when the vanes of the valve extend into the atria. The papillary muscles and chordae tendinae do not open or close the valves but if it fails to act the then valves can turn inside out and not perform its function. The semilunar valves (pulmonic and aortic) perform the same function as the other heart valves – it prevents the backflow of blood but in this case from the arteries into the ventricles when the ventricles relax (diastole). These valves are subjected to greater pressure and have to be stronger than the AV valves. The mechanism of action for the semilunar valves is different from that of the atrioventricular valves. These valves requires backflow of blood to close shut. Without backflow, these valves will remain open. The semilunar valves lack he chordae tendinae and papillary muscles of the AV valves.